You’ll also need one large egg for the egg wash, a little more white sugar to sprinkle on top and butter to grease your pie dish. I use a 22cm ceramic dish, though a tin one is fine. Mix the flour and lemon zest together in a large bowl – a wire whisk is easiest. Add the butter and either cut it in using two knives in a crossing motion, or if you’re a bit slack me, throw it all in the food processor for a quick spurt until it resembles breadcrumbs. Slowly add the iced water one teaspoon at a time until the dough comes together and you can push it into a ball. Divide the dough in half and flatten both halves into disks. Wrap tightly in cling wrap and pop into the fridge for at least an hour, or until it firms up. In a large bowl, combine sugars, cinnamon and cornflour. Again, a whisk is the easiest way to do this efficiently – you won’t need the processor! Add the apple slices to this mix and toss with a spoon until the apple slices are completely covered. At this stage, it’s a good idea to get your oven preheating. Set it to 200 degrees Celsius. Once your dough is firm, prepare some bench space with sprinkled flour. Using a floured rolling pin, roll out one piece of dough into a circle aprox 25cm in diameter. Gently (very gently) fold the crust in half and then quarters. This makes it much easier to handle. Grease your pie dish and carefully place the corner of your dough into the centre of the dish and unfold, leaving excess dough hanging over the edge. 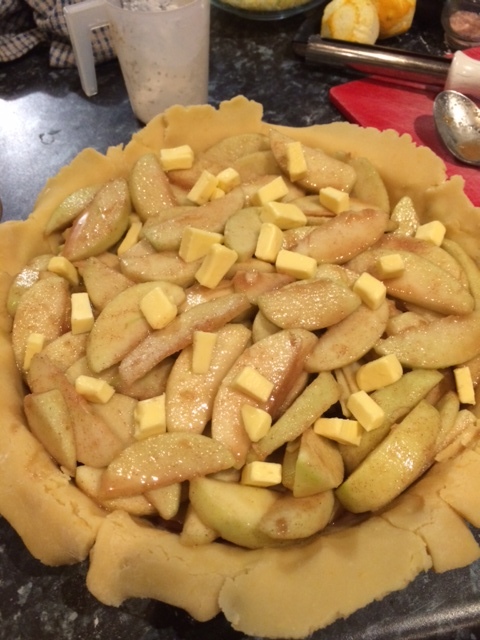 Spoon in your apple filling and sprinkle butter cubes over the top. Roll out and then fold the remaining pastry half into quarters as you did the first time. Place over filling, crimp the edges together as decoratively as you can, and add a couple of slits into the top with a knife to allow steam to escape. I prefer to roll out the remaining pastry half into a more rectangle shape, and cut into strips. 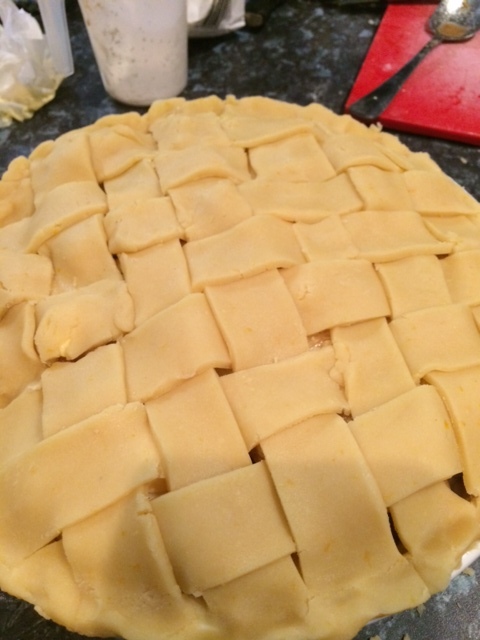 Add strips to the top of your pie in a weaving pattern, which is a little fiddly, but will give you a much more traditional-looking result. Either way, once done, whisk egg in a cup and brush over the top of your pie, then sprinkle with white sugar. Bake for 20 minutes, then reduce heat to 175 Celsius for a further 30 minutes, or until the crust is a deep golden brown. PS – if you ever happen to come across one of Mrs Field’s Cookbooks, do yourself a favour and buy it! I have two. They’re fantastic, and oh, so pretty to look at. All recipes have American ingredients, weights and measurements, but I’ve found it quite simple to convert or substitute. 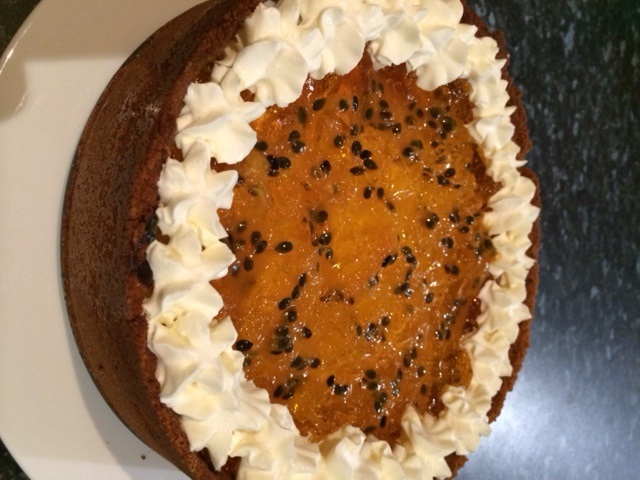 So, a couple of weeks ago, the most fabulous Marianne de Pierres made a request for Cook Club. MdP doesn’t make too many requests. In fact, I pretty much get to do whatever I want for this column. So, of course, I agreed. Cheesecake. Cheesecake! Of course, why hadn’t I thought of doing one before now? Well, that would probably be because…shock, horror…I’ve never made one. Okay, there was that fairly disastrous attempt for Christmas dessert about 18 years ago, but otherwise – nope. Cheesecake virgin. For a first real attempt, I’m happy with the result, though I’ll make some changes next time (see note at end of this post). It was demolished by my family, who are honest – if at times, harsh! – critics of anything new that comes out of my kitchen. I used a 22cm spring-form cake tin for this recipe. Butter to prepare the tin. 350g Arnott’s Nice biscuits, which is about a pack and a half. 3 x 250g packs of Philadelphia Cream Cheese, softened to room temperature. ¾ cup of caster sugar. 1 teaspoon of lemon zest. 1 tablespoon of plain flour. 2 packets of passionfruit flavoured jelly crystals. Prepare your spring-form pan by greasing it with butter. You can line it with baking paper as well, but I didn’t bother. Then, break up your Nice biscuits and add them to your blender. Give them a quick blend until they resemble breadcrumbs. Slowly add the melted butter. Using your fingers and the back of a spoon, push the biscuit/butter mix over the base and up the sides of the pan, trying to keep as much of a uniform thickness as possible. I had a little mix left over. Refrigerate. Pre-heat your oven to 175 C, or if you have a fan-forced oven like me, drop the temperature to 160 C. Using an electric mixer (I have a KitchenAid stand mixer. Best. Kitchen Toy. Ever.) on low speed, beat cream cheese and caster sugar until blended. Add the lemon and lime zests and juices, along with vanilla. Mix well. Then add the flour and blend again. Add the eggs one at a time, being careful not to overbeat. Remove prepared crust from the fridge and pour the cheese mixture into it. Before you put your cheesecake into the oven (middle shelf), add a small bowl of warm tap-water to the bottom shelf. This is to help the crust from drying out too much. Bake for aprox. 35 minutes, or until the centre is *almost* set. Remove from oven and cool completely before carefully removing the rim. Refrigerate for 3 to 4 hours. While your baked cheesecake is chilling, mix jelly as per packet instructions. Once set, chop roughly with a butter knife and spoon onto the top of your cheesecake. 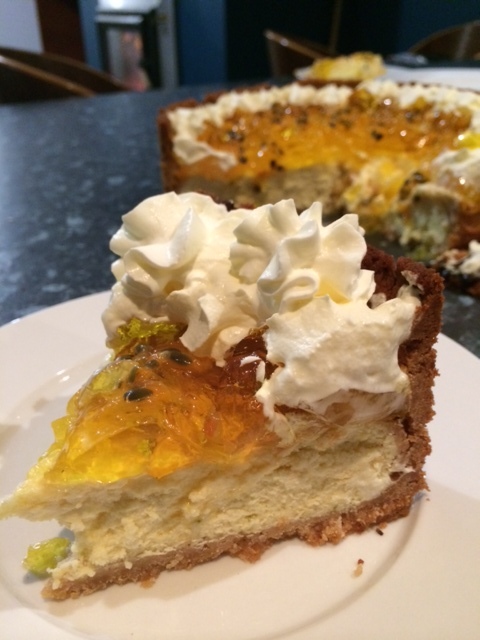 Add passionfruit pulp and decorate with whipped cream around the edges – it hides a multitude of sins! If you do (ahem) use the canned whipped cream, remember it does tend to dissolve quickly. Confessions: Next time, I’m going to bake cheesecake for 25 to 30 mins rather than the full 35, as it was a teeny bit dry. My oven also has ‘hot spots’, and I had to be careful it didn’t bake faster on one side than the other. I also found I had nowhere near enough mixture compared to how high up the tin I’d made my crust, which is why I added the layer of jelly, rather than just candied citrus like I’d originally planned. I will however, be making it again soon after such a great reaction from my family. Looking forward to seeing how your versions turn out, Cook Clubbers! It’s almost Easter, and I have to confess this recipe was one of the trickier ones I’ve put together for Cook Club! After being inspired by an extremely delish photo I found online, I set about making my own version (of what looked like a really simple recipe) to share with you guys. Alas, I need to remember things on the internet can be deceiving! But never fear, Cook Clubbers, after three trials, we now have a simple, pretty much fail-safe Easter Loaf so full of chocolatey goodness it might just send us all into a diabetic coma. Mixed chocolate bars. 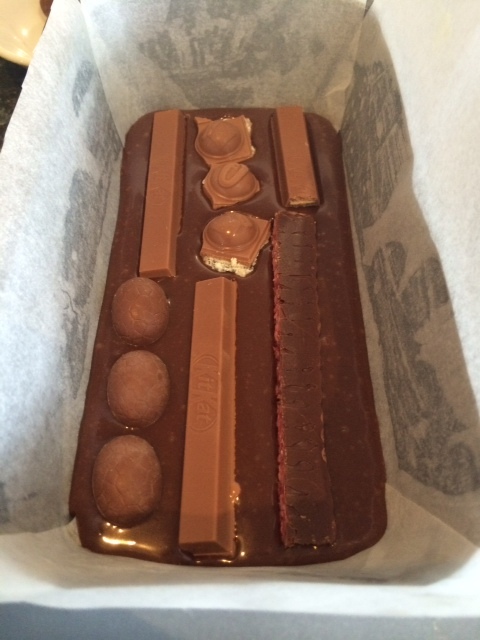 I used Cherry Ripe, Peppermint Crisp, Crunchie, Kit Kats, Wonka’s Cookie and Cream and mixed mini Easter eggs (but nothing too creamy – I made that mistake in attempts one and two). Look for bars that have colourful insides. Prepare your chocolates by unwrapping them all, maybe cutting some in half. You’ll need to work fast so have everything handy. Line your loaf tin with cooking paper. In a medium saucepan set to a low heat, melt butter and condensed milk together, stirring constantly. Once they’re combined, add the chopped chocolate all at once and stir like crazy. It will come together thick and fast, so use your muscles. 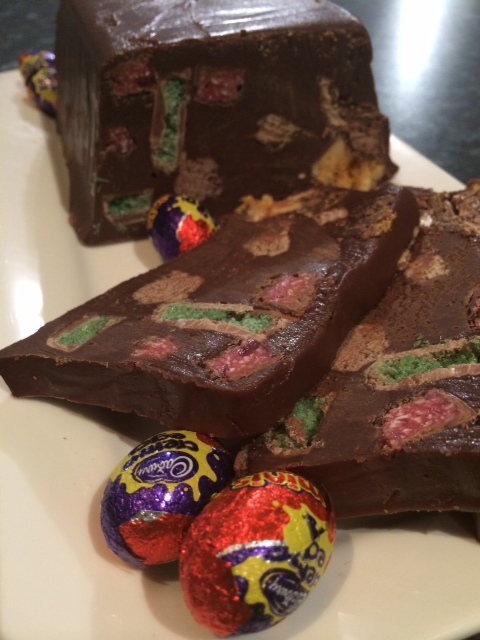 Once your fudge base is combined, layer it in the tin with your prepared bars and Easter eggs, giving the tin a light tap between layers to get rid of any air bubbles. 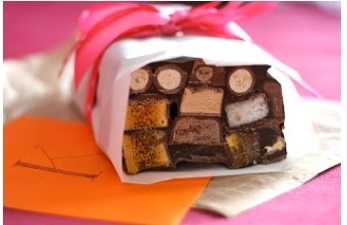 Continue layering bars, fudge, bars until you fill the tin to the top. Refrigerate for 24 hours, or at least overnight. 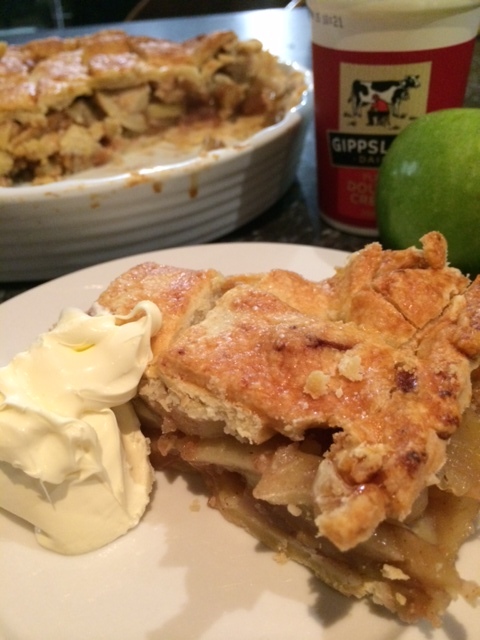 When set, turn out of tin – you might need to give it a good tap on the bottom – and slice. 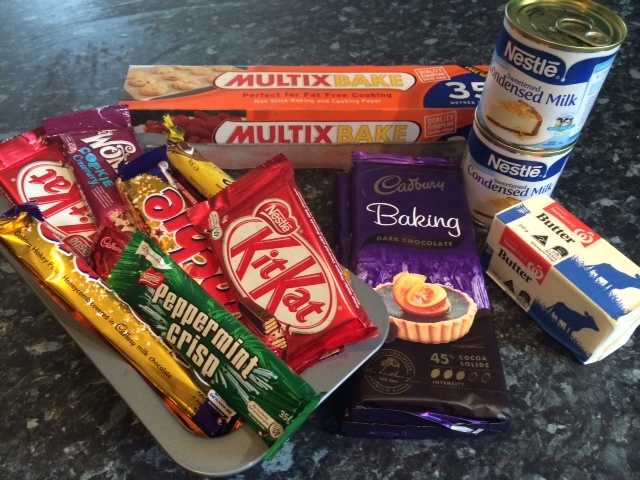 **Confession – my loaf tin is quite deep, so I ended up doubling the fudge mixture. Next time, I think I’ll add more bars and less fudge. ** Don’t be afraid to experiment! I think using milk chocolate in the fudge mix would work well – dark choc made this recipe very, very rich…though my family aren’t complaining! I’d love to see what variations you guys come up with. Recently, my niece turned one. Miss Alice is the only girl-child of her generation in our family (I have 3 boys, my only sister has a son as well as Alice), so this pink stuff is a big novelty for us. I have to admit I was ridiculously excited at the thought of helping out with some goodies for her Alice in Wonderland themed birthday party. 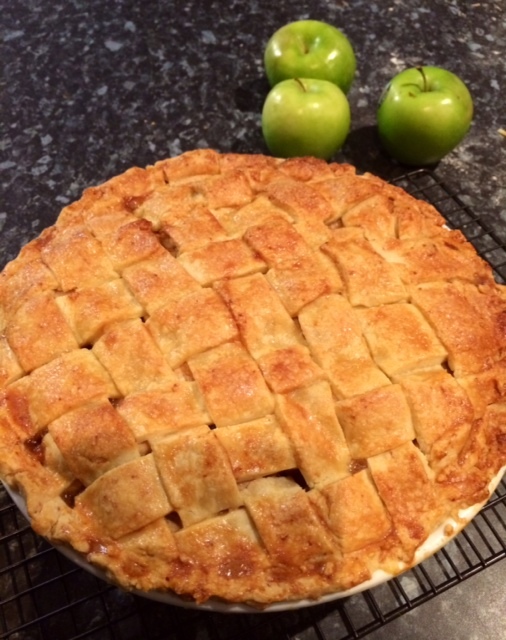 My sister Nicole was expecting a fairly large number of people at her home, so I went with a couple of recipes that while simple, looked really effective. Pineapple, raspberry and blueberry marshmallow – with edible butterflies! To start with, I went with home-made marshmallow. It’s fluffier than the commercial stuff, while at the same time silky smooth. You can flavour it however you like and it’s easy, easy, easy. 2 tablespoons of gelatine. Use the powdered stuff rather than leaves. 1 ½ cups of boiling water. Food colouring. I used yellow, pink and blue. Flavourings. I used pineapple, raspberry and blueberry. ½ cup of corn flour. Edible corn starch butterflies, to serve. Unless you have arms to rival Wonder Woman’s, I’d definitely recommend using an electric mixer for this recipe. I made three separate batches of this – one for each flavour / colour. Grease a large roasting pan with spray oil. In a small bowl, add the gelatine to the boiling water. Stir until combined, using the back of a spoon to help squish out any lumps. Then, place the sugar into a large bowl and add the gelatine mix. Mix with your electric beaters until light and fluffy. This will take anywhere from 5 to 10 minutes. For this batch, I actually mixed for 20 minutes, because I wanted to make an extra fluffy mixture. Just before you finish mixing, add colour and plenty of flavouring. I went with fruity flavours – they not only tasted amazing, but the smell was to die for. Spoon mixture into pan and smooth the top. You need to work pretty quickly at this point because the marshmallow stiffens fast. Pop into the fridge for at least 20 minutes. Remove from fridge and using a sharp knife, cut to size. You could also use cookie cutters for interesting shapes. Combine cornflour and icing sugar in a shallow dish, and toss marshmallow shapes. Can be stored in air tight container for 4 to 5 days. *As you can see, I made 3 batches. I found it easier to do it that way, rather than dividing the mix into thirds. The butterflies were purchased from my local cake decorating store, and while they weren’t very tasty, they looked pretty cute! It’s no secret I’m a huge fan of the humble cake pop. My recipe is a no-bake-no-brainer, and I’ve blogged it a couple of times before. 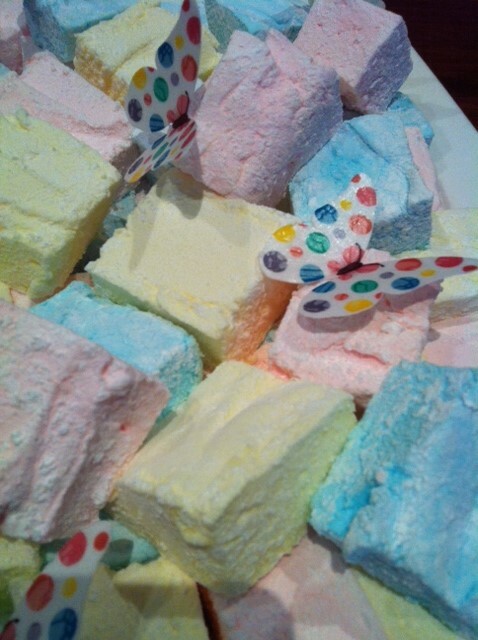 At my niece Alice’s, recent first birthday party, I made a trio of flavoured marshmallows – raspberry, blueberry and pineapple flavoured. 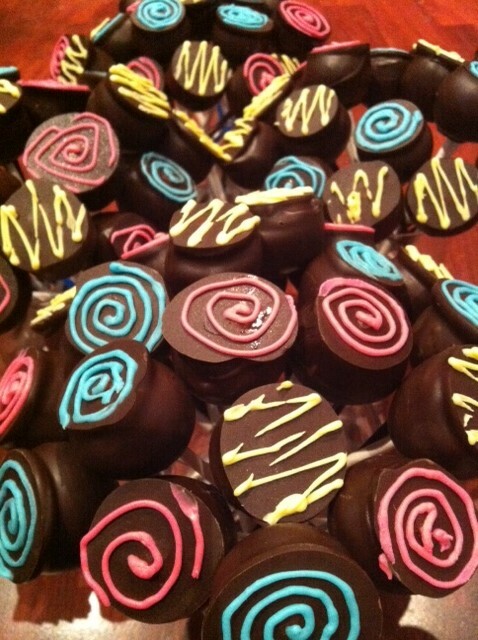 To go with them, I made matching cake pops, patterned with pink, blue and yellow. They were the simplest I’ve made yet. *3 packets of Arnott’s Tim Tam biscuits (for those of you not in Australia and unable to get your hands on the mostamazingbiscuitintheworld, you can replace them with Oreos. Apparently. *240 grams of Cream Cheese – this works out to 80g per pack of Tim Tams if you need to expand or decrease these amounts. *Cake pop / lollypop sticks, available from cake decorating shops or online. *2 packets of dark chocolate buds for melting. 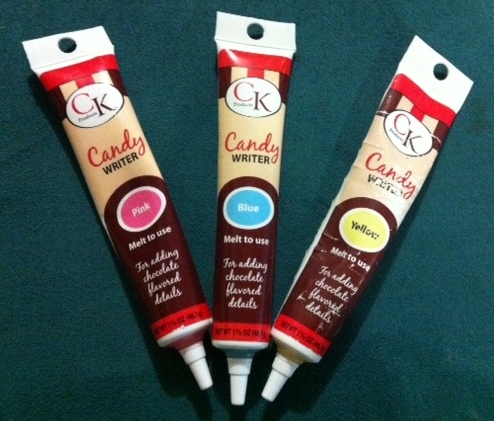 *Candy Writers (actually chocolate in a tube) in various colours. Add the Tim Tams and Cream Cheese to a blender and blitz until well combined. Using a heaped teaspoon for measurement, roll balls of mixture and place on a tray lined with baking paper. Refrigerate for half an hour. Melt a small amount of chocolate in a cup (I use the microwave). Dip the end of a cake pop stick into the chocolate, and push into a Tim Tam ball. Allow to set in the fridge for another 20 minutes. Melt more chocolate in a small but deep container. Dip each cake pop into the chocolate, submerging it completely. Place upside down on the tray lined with baking paper again, forming a flat side on the pops. Once the chocolate is set, decorate with the Candy Writers. Now, these aren’t candy as we know it in Australia. They’re coloured white chocolate with a few extras added in, but perfect for this type of thing. In a cup or mug, add really hot (but not boiling) water. Add the tube of ‘candy’, and wait 5 minutes for it to begin to melt. Massage and roll the tube in your hands before adding it back to the hot water for a few minutes. This enables to chocolate to melt evenly. Snip the top of the tube, and add any sort of pattern you like to the flat top of your cake pops. I found spirals and zig-zags were a quick and effective way to go. As I’ve done before, I served the finished cake pops bunched in a simple glass tumbler. Totally irresistible! 400g of dark chocolate. Use the best quality (with the highest cocoa percentage) that you can, chopped finely. I used a mix of 100g of Lindt and 300g of Nestle Plaistowe. 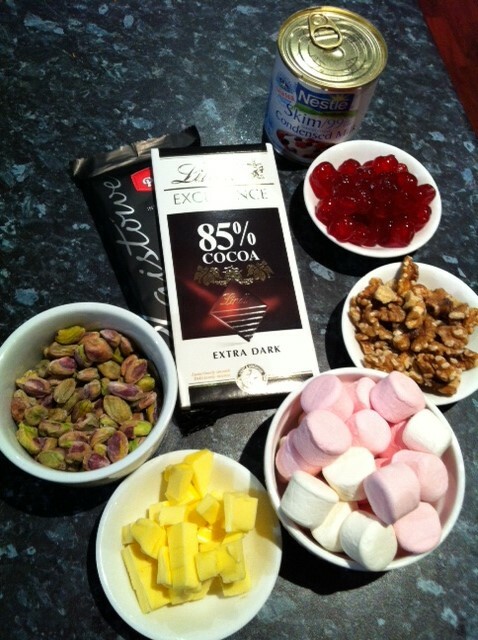 Grease and line a slice tin – aprox 18cm x 18cm – and randomly place around half of your nuts, marshmallows and cherries. Then, to make fudge, in a medium saucepan over a very low heat, melt butter into the condensed milk. Stir continuously as it can stick to the bottom. Once the butter has melted, add all the chocolate at once, stirring vigorously. It gets thick very quickly, so use your muscles! 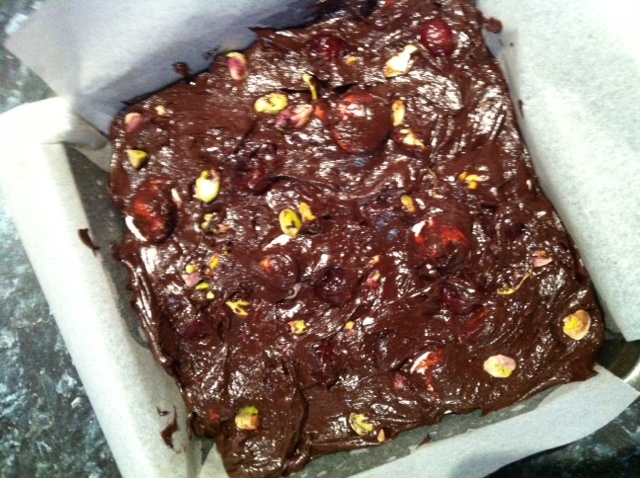 Add fudge to the slice tin, as well as remaining nuts, cherries and marshmallows. Use the back of a dessert spoon or a knife to smooth as much as possible. Refrigerate for at least an hour, then using a super-sharp knife, cut into pieces. Because this one is so rich, I cut it into smaller pieces than I normally would. This one is a kid-special, though I’m pretty sure grown-ups will like it too – especially those in need of a sugar-hit. 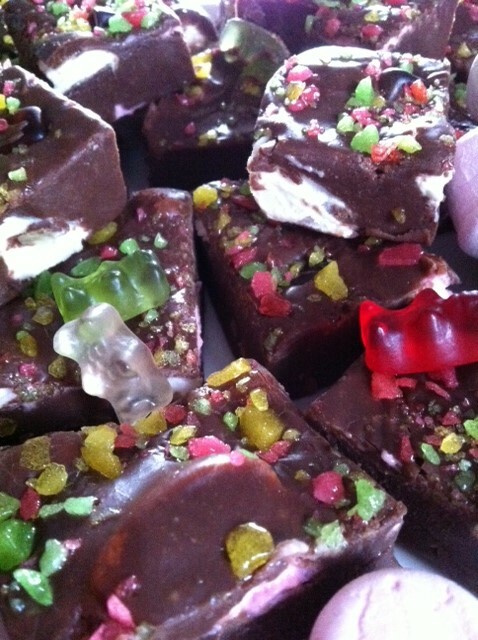 Seriously smooth chocolate fudge filled with marshmallows, gummy bears and sprinkled with popping-candy to top it off. Perfect for children’s parties, or, just because. Start by preparing a slice tin by greasing and lining with greaseproof paper. My tin is about 18cm square. Place about a cup (or handful) of Gummy Bears and chopped marshmallows into the bottom of the tin randomly. Now, it’s fudge time. 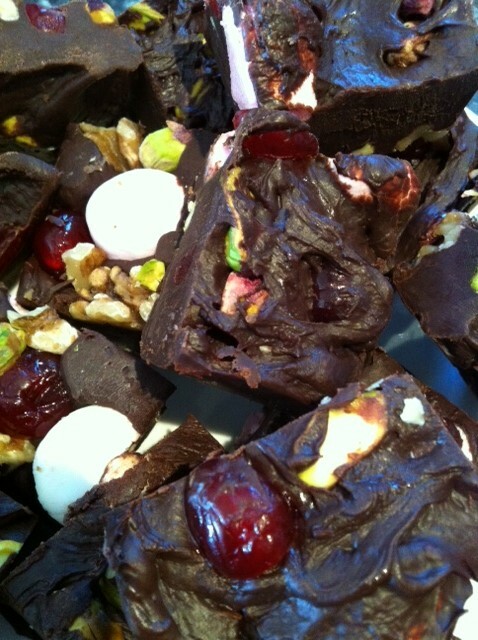 I’ve blogged about this fudge recipe a couple of times before. It’s ridiculously simple. Just add your butter and condensed milk to a small saucepan, and stir constantly over a medium heat until the butter has melted completely. Add chocolate and continue to stir vigorously until it all comes together. 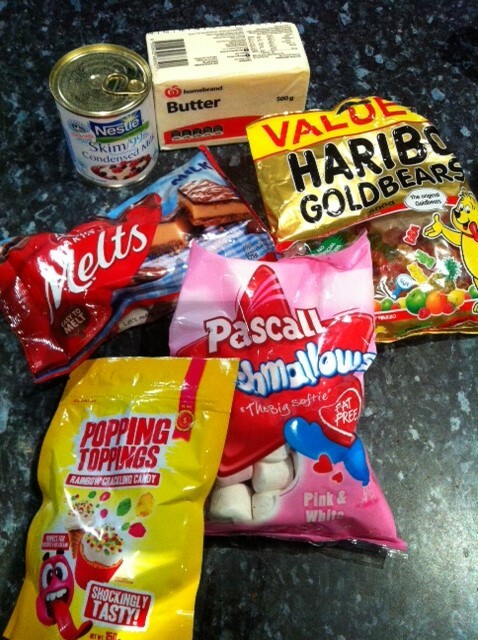 Working quickly, add the fudge mixture to your prepared tin, directly over the top of the Gummy Bears and marshmallow. 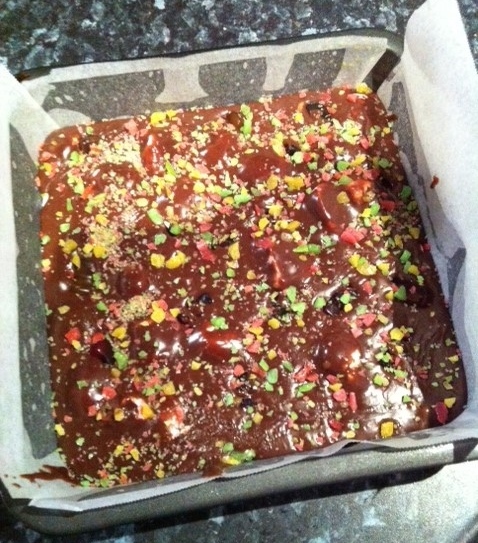 Add a few extra Gummy Bears on top, then sprinkle with Popping Candy. Place the slice tin into the fridge for about an hour. And that’s it! Told you it was too easy.